The Gates Cambridge Scholarships were established by the Bill and Melinda Gates Foundation with a $210 million donation to enable outstanding graduate students from all around the world to study at the University of Cambridge. The gift remains the largest single donation to a UK university in history. Each Gates Scholar is given full funding for postgraduate study at Cambridge for the duration of the degrees, as well as life access to Gates House in the University Centre. The award includes all tuition costs (up to £34,107 per year) and a generous maintenance allowance by UK standards, currently set at £17,500, as well as airfare, retreats, and extensive mentorship opportunities. Scholars are also able to access travel funds for conferences, have exclusive use of recreational and social facilities, and participate in an annual retreat to the Lake District in England. The first scholars arrived at Cambridge in October 2001 and previous recipients continue to support the next generation of scholars long after they have completed their studies. 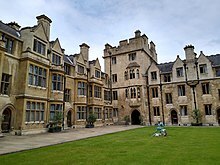 The Gates Cambridge Scholarships are very similar in structure to Oxford University's Rhodes Scholarships, although the Gates Scholarships are awarded through a more centralized process and have a larger endowment. Their duration is also more flexible, as the Rhodes and Marshall Scholarships generally only last for two years (in some cases, up to three). Similar to the Rhodes Scholarship, the international Gates Scholarships are far more competitive than most American scholarships (in 2017 1.1% of roughly 5,000 applicants for the Gates). Countries of origin of Gates Cambridge Scholars, 2001-2013. Applicants from any country other than the United Kingdom are eligible for the scholarships. In the first 13 years of the program (2001-2013), 1236 individuals from 95 different countries have been awarded scholarships. By statute, approximately 40% of scholars are intended for citizens of the United States (in practice, as of 2019[update] the figure has been about 50%). Other common countries of citizenship have been Germany (5.9%), India (5.3%), Canada (4.9%), Australia (4.1%), and China (3.0%). The Cambridge Gates Trust aims to maintain about 200 Scholars in residence at any time, and 90-110 Gates Scholars are elected each year from a pool of over 4500 applicants. The Trustees are required to award scholarships on the basis of a person's intellectual ability, leadership capacity and desire to use their knowledge to contribute to society throughout the world by providing service to their communities and applying their talents and knowledge to improve the lives of others. The Trust does not set an official minimum GPA, however, the average GPA of Gates Scholars as of 2011 is 3.93, with a range of GPAs from 3.9 to 4.0 over the past decade. All LSAT/GMAT/GRE test scores must also be submitted and are generally in the 99th percentile. All applicants must include several letters of recommendation from their university, professors, and community. Applications to the Gates Cambridge Scholarship are extremely competitive and less than 3% of applicants are awarded the scholarship each year. In establishing the scholarship, The Bill and Melinda Gates Foundation hoped to create a network of future leaders from around the world who would bring new vision and commitment to improving the life circumstances of citizens in their respective countries. Over time, it is anticipated that Gates Cambridge Scholars will become leaders in all their respective fields, and will help to address global problems related to health, equity, technology, and learning - all areas in which the Foundation is deeply engaged. In 2002, the Gates Scholars self-organized and elected a student committee titled "The Gates Scholars' Council". The Council aims to represent the Gates Scholars at Cambridge and to build a scholar community interwoven into the fabric of the University. 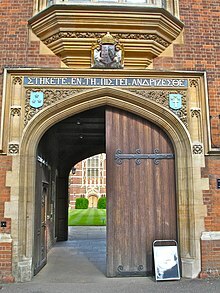 In cooperation with the Gates Cambridge Trust, the University and various academic and professional organizations, the council organizes a number of successful academic, social and professional events that have distinguished and built the reputation of the Gates Scholars at Cambridge University. The scholarship is particularly known for its strong academic and social community at Cambridge. In 2005, the scholars once again self-organized to create the Gates Scholars Alumni Association. This association aims to build upon the friendships and contacts that were first made at Cambridge and to bridge the gap between the different generations of scholars. It is an active and growing organization, with members dispersed all over the world. In 2014, through alumni donation and collaboration this community of Gates Millennium Scholars cofounded and successfully launched GatesScholars.com | Think Tank and Global Community. GatesScholars.com | Think Tank & Global Community is a grass roots initiative developed and financed by Gates Scholar Alumni; the platform is a networking portal with capacities to further Scholar collaboration for the continued betterment of our global village. McCormack, Steve (9 March 2006). "Gates opening for the leaders of tomorrow". The Independent. Archived from the original on 12 August 2007. Retrieved 2008-10-02. ^ "The Programme". Gates Cambridge. ^ "New Gates Cambridge international scholars selected". University of Cambridge. 2012-04-11. Retrieved 2019-01-31. ^ mandy (7 April 2017). "Gates Cambridge Class of 2017 announced". Gates Cambridge. Retrieved 2 March 2019. ^ "Gates Cambridge Scholarships - Apply - How Competitive". Gates Cambridge Scholarship. Archived from the original on March 15, 2012.